Make a Minecraft Mod with LearnToMod Software. Minecraft is an awesome game because it gives its community the ability to make their own modifications (mods) to the game through custom coding and third-party platforms. Making a mod can be done by users that are less familiar with coding languages through the usage of third-party software like LearnToMod. Learning how to make a Minecraft mod involves opening a third-party tool like LearnToMod, selecting the right mod language, adding custom code (written by yourself), naming & saving it. 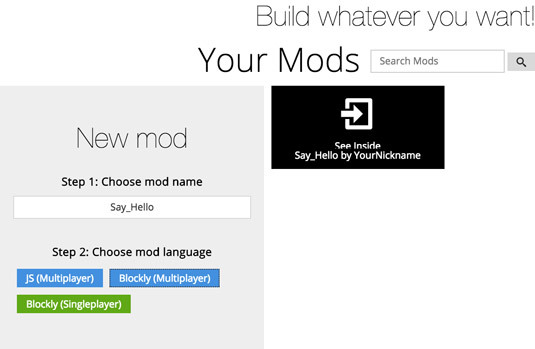 Follow the step-by-step instructions for how to create mods in Minecraft. Open the LearnToMod Software and Click on the Mod tab at the top of the screen. Selecting this menu item will take you to the appropriate place in the software to see your library of existing mods, or create a new mod. Choose a Name for your Mod. 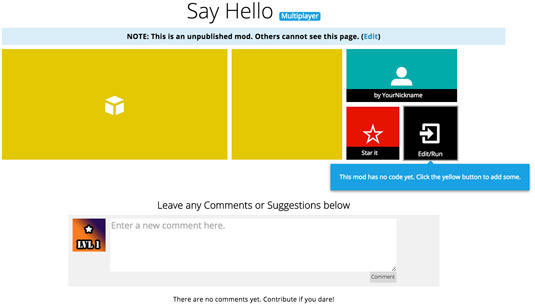 On this page, you can assign a title for your mod such as say_hello. Of course, you can choose any name you like for your mod. It may be a good idea to choose a name that describes your mod so that you can find and use the appropriate mods later on. 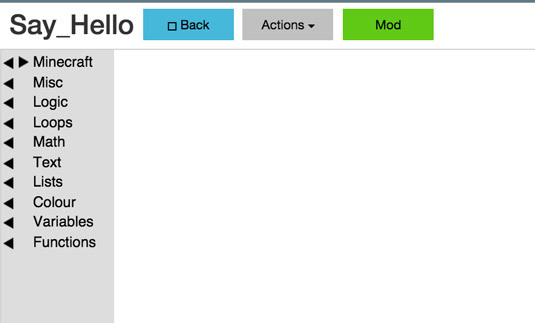 In the example above, the mod entitled “say_hello” is descriptive and lets you know exactly the purpose of the mod! Click the Blockly (Multiplayer) button to create a server-side mod. These instructions show you how to make server–side mods, which means that they’re multiplayer. Sometimes players will select the Blockly (Singleplayer) mod language to test out their mods in the privacy of their own Minecraft realm. Once you feel comfortable about the execution of the mod, you can transfer it to the Multiplayer version. After selecting the appropriate mod language, a new mod block will appear on the right side of the screen, as seen above. Click on the new mod block. 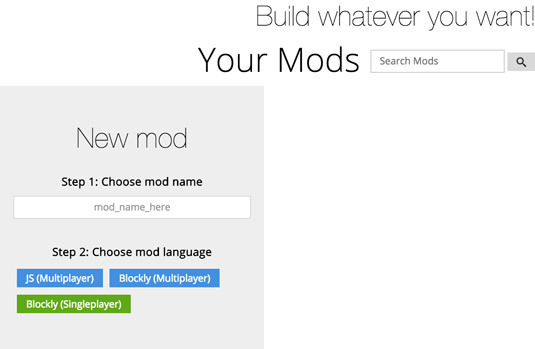 By selecting the new mod block, you are now able to see the mod’s description page. This screen provides you the ability to see details about the mod, the author (in this case, yourself), allows for editing or testing of the mod, and also has an area for other community members to comment on your mod! After clicking on the code button, you will be taken to the programming environment. This is where all the back-end magic happens and where you can start to use functions and variables to build out your mod code. Add appropriate code and actions to your new mod. Simply add code to your mod, save, and you have made a new Minecraft mod! However, before begin add random coding or functions your mods, you should first outline it to understand all of its components. After you understand the structure of your mod and how you want to approach breaking it up into functions, you can outline it in LearnToMod. Create all the functions that you outlined in your planning, but don’t fill them in yet. Just let the functions sit in your mod, empty, with names and parameters. Though these functions may end up changing as you iterate over your gameplay loop, it’s important to start piecing together the code early on so that you don’t miss any crucial actions. Call the functions from the other functions as you think you would need to. For example: You will have a main function, and it might be that the main function calls all the other functions. If that is the case, put a call to each function inside of main. These steps are important because it helps you visualize your code! Now that you know how to make a Minecraft mod using LearnToMod and outline your mod, learn how to properly write & code your first Minecraft mod.